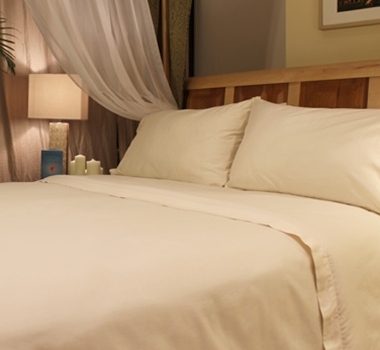 This sheet set is made from 400 Thread Count Pure Certified Organic Cotton Sateen. From seed to shelf, the organic cotton is grown and processed free of pesticides, harmful dyes, VOC's, arsenic and other carcinogenic chemicals. The sheets have been manufactured with fair trade labor and environmentally friendly practices. Wind power is used as an environment friendly energy source. Twin Flat sheet - 70" x 108"
Full/Queen Flat Sheet - 90" x 108"
King Flat Sheet - 110" x 108"
Twin Fitted Sheet - 39" x 75" x 18"
Full Fitted Sheet - 54" x 75" x 18"
Queen Fitted Sheet - 60" x 80" x 18"
King Fitted Sheet - 78" x 80" x 18"
California King Fitted Sheet - 72" x 84" x 18"
Queen Pillowcases - 20" x 32"
King Pillowcases - 20" x 40"